This article is about a town in the Czech Republic. For other uses, see Čáslav (disambiguation). 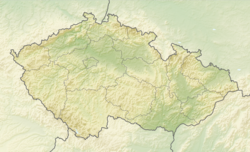 Čáslav (Czech pronunciation: [ˈtʃaːslaf]; German: Tschaslau, Hungarian: Császló) is a town in eastern part of Central Bohemian Region of the Czech Republic. The history of Čáslav begins after the year 800 with the founding of a citadel and settlement called Hrádek. Near Hrádek, a new town with a huge square was founded by King Přemysl Otakar II in 1250. In 1421, Bohemian parliament debated in Čáslav and voted in a new Hussite government. During the Thirty Years' War, in 1639 and 1642, Čáslav was devastated and burnt down by Swedish troops. In 1751 Čáslav became the centre of region (county). Čáslav Museum, one of the oldest regional museums in Bohemia was founded in 1864. In 1910, part of the cranium of famous Hussite general Jan Žižka z Trocnova was discovered in Čáslav parish church. The synagogue was built between 1899 and 1900 in Moorish style, designed by architect Wilhelm Stiassny. It was used until 1939 by the local Jewish community, which was then almost totally wiped out during The Holocaust. After World War II the abandoned building saw use as a warehouse, and then (between 1969–1989) as a gallery. In 1989, however, it was returned to the Jewish Community in Prague and has recently been restored. Čáslav is sometimes called a town of majorettes, because of the local town team, which are winning medals from Czech and world competitions one by one. Two of the most known sportswomen from Čáslav are Ludmila Formanová and Jarmila Kratochvílová, both World Champions in running at 800 m.
Wikimedia Commons has media related to Čáslav. Wikisource has the text of the 1905 New International Encyclopedia article Czaslau. This Kutná Hora District location article is a stub. You can help Wikipedia by expanding it.